During this past holiday season, Lynn and I were often delighted by the refreshing reports of random acts of kindness that occurred throughout the world – from small acts like paying for a stranger’s coffee to closing a private golf course for a day so that Coast Guard members could use the facility as a “thank you” for their heroic work during the recent rash of hurricanes. But, why is it that we tend to display kindness more often during the holidays or on February 17th, Random Act of Kindness Day (an occasion I recently discovered)? All of us have countless opportunities to treat our families, coworkers, customers and even total strangers with kindness. Being kind is infectious; usually the most irate, disgruntled customer can be calmed with words that demonstrate empathy and respect. Recently, I was leading a three-day workshop – If Walt Ran Your Organization – for a group of state and local government leaders. 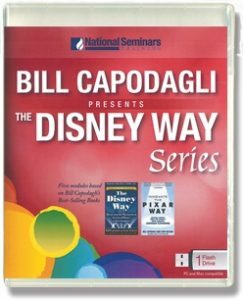 I presented an example from a new chapter in the 3rd edition of The Disney Way – Love: The Real Pixie Dust. The core message is how mutual respect and yes, “Love” can make a difference. I shared a story about Police Officer Rick McCall from Kalamazoo, Michigan who had apprehended a violent gang member three times. One day while on patrol, Rick spotted the gang member who he had known to have an outstanding arrest warrant. As Rick pursued the suspect on foot, the man jumped over a chain link fence, fell to the ground and dropped a gun. Rick jumped after him but got caught on the fence, hanging four feet from the ground, but managed to grab the suspect’s arm. When he saw the gun, he shouted “NO” and to Rick’s amazement, the suspect pushed the gun away and laid face down on the ground. After returning to his patrol car, Rick asked the suspect, “Why didn’t you shoot me?” The man replied, “I wouldn’t do that…you have always treated me decently.” Treating even a violent criminal with respect and dignity may very well have saved Officer McCall’s life! Chris told me that he first used the “Love Bank” concept in Iraq while working with the local population. He believed if you expect help and cooperation from others, you need to make deposits of “loving kindness” (a term I learned from Acts Retirement-Life Communities, one of the featured organizations in the 3rd edition of The Disney Way) into a “Love Bank.” Therefore, when you need to make a withdrawal, you have sufficient capital. Chris explained that he wants to be sure his officers make frequent deposits into the “Love Bank.” This becomes a measure of how a community trusts its law enforcement officers. Unfortunately, not long after our workshop, one of Chris’ officers shot a 17-year old in his home. But rather than rioting, looting and needlessly destroying property, residents of Fountain, Colorado knew their police were working long hours to investigate the shooting; during this process, residents brought 10 pizzas to the station for the officers! Indeed…the “Love Bank” is infectious! 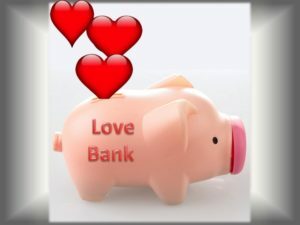 How can you start building your “Love Bank” account? You’ve probably read my words before – ENGAGE THE CUSTOMER. I define the three levels of customer engagement as transaction, absorbed and connection. The first level is transaction. In a retail establishment, if a customer asks, “Where is a good place to have lunch?”, your answer could be, “There are several restaurants on the next block.” You have completed the transaction by politely answering the customer’s question with minimal engagement. The next level is absorbed. Answering the same question above, you may ask, “What kind of food do you like?” Assume the customer answers, “Italian.” You reply, “One of my favorite restaurants is Tony’s. It is on the next block, this side of the street. Enjoy.” You have not only completed the transaction with the customer, you have engaged them to solve a problem and recommended a solution. The ultimate level of engagement is connection. Using our same example, after recommending Tony’s in the absorbed level, you add a personal touch such as “My name is Bill, tell Tony I sent you there. If you have time after your lunch, stop by and tell me how you liked it.” All of a sudden, you are connected with your customer, your friends, and perhaps discover that you even share the same favorite restaurant. Of course I realize you do not have the time or opportunity to “connect” with all of your customers. However, it takes very little effort to elevate from transaction to an absorbed level of engagement. Try asking about a purchase. You might ask, “Is this a gift? Would you like it gift wrapped?” or “I notice you have a VFW polo shirt. Are you a veteran? Thanks for your service.” Just caution against falling into the trap of delivering what I call the “super market robotic response” – “paper or plastic”, “thank-you”, “have a nice day.” If the engagement is insincere, it just becomes part of an automatic transaction response. Just as the folks in Fountain, Colorado did, building your “Love Bank” account will enable you to survive the occasional poor customer experience that tends to occur even with the best service providers. Lynn and I wish you a Happy, Healthy and Prosperous New Year! 2016 3rd Edition Available NOW! "You know those books you read again and again? Well, I'm addicted to the book "The Disney Way". I was a fan of it for so long and then the author said he wanted to feature my cosmetics startup TYRA Beauty in this latest edition! It's such a fun book and you'll learn a lot! Let me know how much you like it - I can't put it down!"